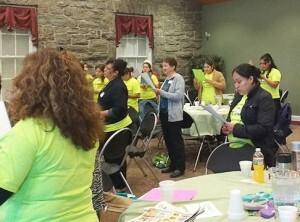 On March 12, over 35 women met together for a Day Apart, held at Towamencin Mennonite Church. 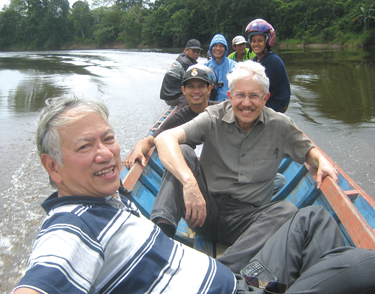 Attendees came from various Mennonite churches in Eastern District and Franconia Mennonite Conferences. A large group coming from Centro de Alabanza de Filadelfia, a South Philadelphia congregation that is made up primarily of immigrants from Mexico, Central America, and Latin America. This gathering was a bilingual retreat that gave the o pportunity to reflect on the theme “Sistering for Life.” The term “sistering” refers to a practice in carpentry in which structural repairs are made by attaching new wood beams to weak (sagging, cracked or twisted) joists to make the original stronger. All of us are strong at times and can help those who are weak; all of us find it difficult to make it on our own at times and need others to support us. Sistering is a gift that we embody as God’s women who are following Jesus throughout our lives. The program’s theme was fleshed out in various ways. Songs were led in Spanish and English by a team from Centro de Alabanza and by Dorothy Beidler from Norristown New Life. A meditation was given by Ana Rosa Hernandez, a member at Centro de Alabanza, on Proverbs 17:17 (“A friend loves at all times, and a [sister] is born for a time of adversity.”) and Ecclesiastes 4:9-10 (“Two are better than one, because they have a good return for their labor; if either of them falls down, one can help the other up. But pity anyone who falls and has no one to help them up.”) Four women — Linda Esh, Dania Hernandez, and Ligia Canavan, from Centro de Alabanza, and Jenny Duskey of Ambler Mennonite – were designated to tell a story of being sistered. From them came accounts of loss, sexual abuse, stepping into unknown territory during a move, and finding faith in the midst of struggle, along with the spiritual, emotional and physical help they found along the way. A children’s story, “Four Feet, Two Sandals”, was read to illustrate how something as simple as sharing a pair of sandals at a refugee camp can build sisterhood. Leticia Cortes, pastor at Centro de Alabanza, led us in activities that required teamwork and seeing how we felt in each other’s shoes. A sandal was given to each participant to decorate and to write a message on; these were then exchanged with another woman, with whom a prayer and blessing were shared. Throughout the day we sat in table groups getting to know six or seven other women in a deeper way as we reflected together on our experiences of being sistered by Jesus and by girls/women at different stages of our lives. Women who could interpret between Spanish and English were each assigned to a table so that all of us could understand each other. I felt great joy in spending time with the women who gathered on March 12th. Not knowing Spanish, I had the opportunity to experience what it’s like to be in the minority for once, but also to listen to a beautifully expressive language. Hearing the stories of women often moved me to tears and to laughter, and I marveled at the deep, and often exuberant faith that has emerged in spite of, or perhaps because of, difficult circumstances in their lives. Each year, this event challenges my faith journey and stretches my world-view. The Holy Spirit is alive and well and very evident as we meet. It is a privilege to take part in creating a holy space for this gathering to happen and to take part in it. The Sistering Committee is working to hold annual gatherings like this and are planning for another one in 2017 Keep watch for announcements about it! The Sistering Committee is especially grateful to Mike Clemmer and his team at Towamencin Mennonite Church for allowing us to use their facility and giving so much help in bringing our event to fruition. 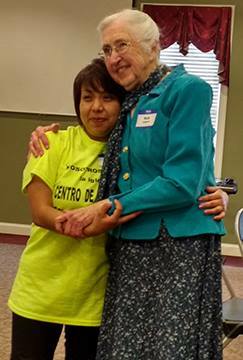 And I, Anne Yoder, want to thank the other members of the Sistering Committee for their wisdom and prayers and efforts: Marta Castillo, pastor at Norristown New Life, Leticia Cortes, pastor at Centro de Alabanza, and Doris Diener, of Franconia Mennonite Church. The Sistering Committee represents Mennonite Women USA for eastern Pennsylvania (and the conferences’ outlying congregations) and looks forward to serving the women of our area. If you are interested in serving on the committee, please contact Anne Yoder at ayoder1@swarthmore.edu.